History: The origin of the Red Dao is uncertain. It has been surmised that they arrived not long before the H’mong during the 18th Century. 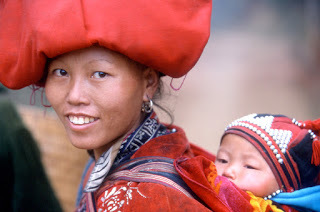 Language: The Red Dao spoken language belongs to the H’mong – Dao language family. Their writing is based on Chinese characters adjusted to accommodate their own spelling. Costume: Red Dao women usually wear a long blouse over trousers. Their clothes are colorfully embroidered with designs that appear on both sides of the material. The men typically wear a short shirt with long trousers, and a head-scarf. Both men and women have a square piece of fabric on the back of their shirts which represents that they are children of God. They wear similar hairstyles – long on top, with the rest smoothly shaved. Many women shave their eyebrows as well. Women also wear a distinctive red triangular shaped turban decorated with silver coins and red tassles. 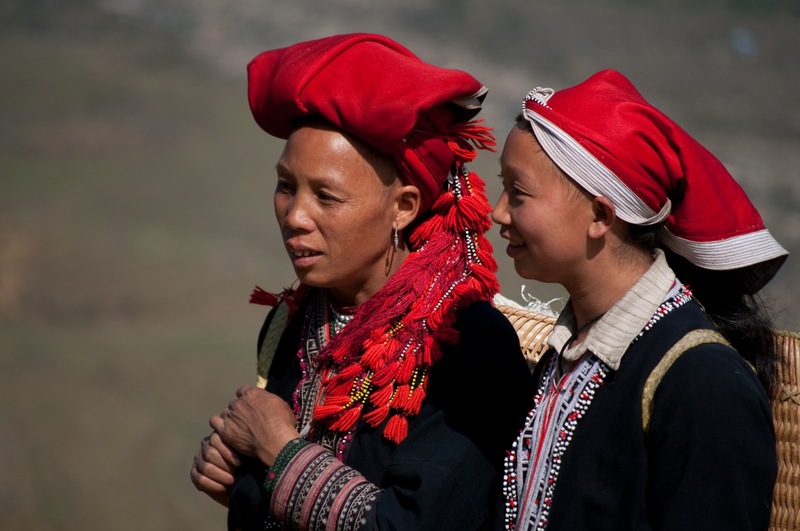 Social organization: The Red Dao men play a dominant role in the family, community and the economy. They also play a major role in ceremonies such as marriages, funerals, and building new houses. The Dao people have many different family names. Each lineage has its own system of different middle names to distinguish people of different generations. 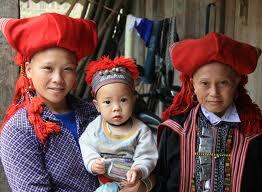 Birth: The Red Dao women usually give birth in their bedroom with help of their mother and sisters. The new born is given a bath with hot water. The family hangs green tree branches or banana flowers in front of the door to prevent evil spirits from bringing harm and wickedness to the baby. When the baby is three days old, they celebrate a ritual in honor of the mother. Marriage: Parents select partners for their sons. When a boy is fourteen or fifteen years old, his father takes him to have a look at a girl he thinks is fit and healthy and can help with the housework. The couple chosen to be married then have to consult a diviner who judges their compatibility based in a ritual using a chicken leg, and their horoscopes. The girl’s value is shown by how many silver coins, chickens, pigs and jars of rice wine the boy’s family have to give her family. During the marriage ceremony, it is customary to stretch a piece of string in front of the procession. The groom carries the bride on his back, and she must step over a blessed pair of scissors to cross the threshold into his house. When a family has no son, the parents can buy a groom who will live happily with his bride’s family. However, if a boy is so poor that his family can’t afford a dowry, he has to live in his bride’s house – which causes him great shame. Funerals: When there is a death in the family, the deceased’s children have to invite a man called thay tao to supervise the rituals and find the right piece of land for a grave. The deceased is wrapped in a mat, placed in a coffin inside their house and carried to a grave built of stones. In the past, if the deceased was over 12 years old the body was cremated. The funeral rituals celebrated ensure that the deceased rests in peace. The ceremony, which lasts for three days, usually coincides with initiation rites for Red Dao boys. The first day liberates the spirit of the deceased, the second day is a time to worship the deceased in the home, and the third day is the boy’s initiation rite. The boy has to sit on a throne at the highest place in the village until he falls into hammocks hanging below him. This represents him falling down from the sky to be born on earth, another symbol of the Dao belief that they are the direct descendents of God. Housing: The Dao ritual to select land for a new house is very important At night, the household digs a bowl sized hole and fill it with rice grains that represent people, cows, buffalos, money and property. The family will know where to build the house based on the dreams that follow during the night. In the morning, the family inspects the hole to see if the rice remains – if not, the house will be built elsewhere. Beliefs: Dao religion has elements of Confucianism, Buddhism and Taoism. They worship the ancestors of the family together with the legendary holy man Ban Vuong, who is considered the earliest ancestor of the Dao people. The best moments to go to Sapa.